The study of Geography in a Montessori classroom encompasses the physical features of the earth, boundaries and territories created by man, and the cultures that were developed in the various parts of the world by human beings. The needs of man are universal, but the way these needs have been met, differ. So we have many different peoples around the world who live differently, who have adapted differently to what the world has offered them in different locations. The physical features of the Earth are presented in a hands-on way to young children. This globe give children a tactile experience of land and water. Land areas are represented by patches of rough, brown sandpaper. Areas of water are characterized by smooth, blue painted surface area. Future lessons allow the child to delve more deeply into landforms and waterforms (such as island, strait, isthmus, archipelago, etc.). These large wooden puzzle maps are among the most popular activities in the classroom. The child can put each puzzle piece into place by means of a little knob on its flat, shiny surface. The introductory map of the world illustrates the eastern and western hemispheres of the Earth. Each hemisphere has a separate puzzle piece for each continent. After working with this world map, the child can delve into the puzzle maps of continents in which each country is represented by a separate puzzle piece. Students also learn about the different countries located on each continent. Young students assemble the puzzle and learn to label the countries contained within. 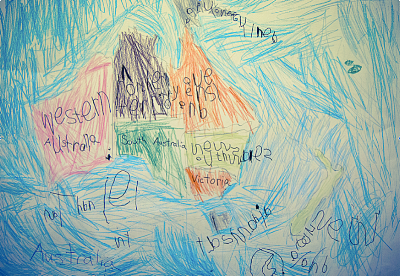 Older students enjoy an extension of this initial introduction by creating a continent map of their own. The child traces each country and labels these using the puzzle map as a guide. Many students go on to assemble their own atlas containing their hand-made puzzle maps! Cultural Geography is the study of the life of man, the way humans live, and the way of life that has been established by a human society to sustain life. This curriculum provides children with an opportunity to explore the larger world. As part of a rich exploration of the different cultures of the world, students learn about the people, terrain, and animals of each continent as they study them in the course of the three-year cycle.